Max Gail as Llewelyn "Lew" Farley Jr.
Richie and his friends discover a skeleton on property coveted by a development corporation. Richie learns that the computer game he has been play testing has a very different application for the convict who invented it, and who has $12,000 hidden away on the outside. Richie uncovers a secret water project while testing the security of a chemical company for its security chief, who disappears after getting Richie's report. NOTE: Jameson Parker brought the character of "A.J. Simon" over from DeGuere's other series, Simon & Simon . Matthew Laborteaux returned the favor by playing "Richie Adler" in the Simon & Simon episode "Fly the Alibi Skies." Lew can't understand why a Gazette photographer was assaulted after covering a gubernatorial candidate until Richie uses Ralf to enhance the pictures he took and finds a fugitive embezzler. _"A Chip Off the Old Block"
A fellow student of Richie's is caught using the school computer to embezzle bank funds, but the fellow who catches him decides to use the kid's idea for himself. A criminal taps into the police computers and sabotages them so that they cannot properly respond when his accomplices commit a crime. _"Return of the Big Rocker"
Farley learns that a rock star long presumed dead is really alive, but not responsible for the glut of "unknown" new songs his old record company is releasing. Farley investigates a computer dating service unaware that Richie has secretly signed up his mother for the same service. Ralf mysteriously malfunctions and Richie becomes convinced that it is because of unusual electrical interference from a neighbor's satellite dish. 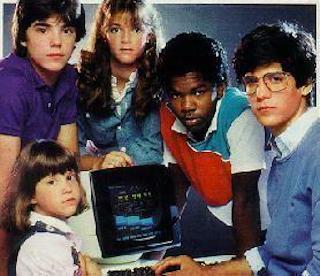 The FBI arrests Richie after trying to solve a challenge from a renowned hacker. Richie uses the TV-ratings meter at Ham's house to investigate how the system works and discovers proof that a consumer advocate's program has been sabotaged in the ratings. Richie solves a hieroglyphic inscription on a tomb, but it seems to be causing uncharacteristic behavior in all those who read it aloud. Mrs. Adler's new maid leaves bugs around the house just before a visit from Mr. Adler, who is supposed to be in town on government business. _"The Lollypop Gang Strikes Back"
Richie looks into why the Social Security system has declared Carson Marsh dead while Lew follows a gang of elderly heisters. Lew asks for Richie's help in investigating the disappearance of a marine biologist who was using computers to communicate with dolphins. A KGB agent is pursuing Alice's new boyfriend. Richie and Farley quarrel when Farley suggests that Richie's new girl friend set him up when information about a prototype tank proves false. _"May I Take Your Order Please?" Alice overhears two men planning an order while working at a fast food place, but no one believes her, so she sets out to do something about it herself. Editor's Note (3/98): I am saddened to report that Donna died unexpectedly last month. I will try to answer any questions regarding this series, but since I never saw it I probably will not have an answer for you.